Is Britain Heading for a Re-Run Brexit Vote? Anti-Brexit protesters demonstrate opposite the Houses of Parliament in London, Britain, January 16, 2018. Pressure is growing on British Prime Minister Theresa May to hold a second Brexit referendum, and the idea is beginning to attract backing from across the political spectrum, even from unlikely figures, including leading Brexiter and the one-time leader of the UK Independence Party Nigel Farage. Shifting public sentiment is acting as a backdrop to the efforts of Prime Minister May to try to shape a consensus when it comes to colleagues in her own fractious Cabinet. She is holding a series of talks this month with ministers to try to hammer out an agreement about what kind of post-Brexit relationship she should try to negotiate with the European Union, Britain’s largest trading partner. Her previous endeavors to secure consensus have proven unfruitful, as soon as it looks like she has shaped agreement, it is upended by ministers publicly laying down new demands. Her ministers are fundamentally divided, adding to public confusion and fear about Brexit - Britain's exit from the European Union. Some lawmakers want a clean break with Europe; others hope to salvage a deep relationship that would leave Britain in the bloc’s single market and customs union, but outside its political structures and with no say in what EU institutions decide, much like Norway. May has rejected allowing a second referendum to approve any deal Britain secures with the bloc, on the grounds that pledging another plebiscite would undermine negotiations by encouraging the Europeans to offer a rotten deal. Labor's Jeremy Corbyn has also rejected the idea of a re-do. Even so, a poll by BMG Research found 57 percent would support a re-run, a three percent increase from a similar survey conducted in December. The idea of holding a second referendum took off after Farage said last week on British television that “my mind is changing on this. ”The proposal for another vote had been pushed relentlessly in previous weeks by Labor politician and former Prime Minister Tony Blair and Nick Clegg, former deputy prime minister in the Conservative-Liberal Democrat coalition government of May’s predecessor, David Cameron. Some Farage critics say his sudden change of heart about a re-run vote can be explained by an almost pathological need for the political limelight. 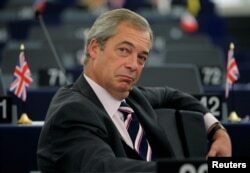 The European Parliament's Brexit coordinator, Guy Verhofstadt, has mocked Farage, asking what had been put in his coffee or tea.Some of Farage's followers remain furious at the shift, fearing he may have made a political misstep. FILE - Nigel Farage waits for the start of a debate on the last European Summit at the European Parliament in Strasbourg, France, Oct. 26, 2016. But there are signs of mounting public anxiety about where Britain is heading, fueled in part by the poor performance of the economy, exasperation at the complexity of leaving the European Union, and the falling numbers of Europeans wanting to work in a floundering national health service that relies in large part on foreigners to make up for the shortage of home-trained doctors and nurses. Jean-Claude Juncker, president of the European Commission, echoed Tusk, saying the door is still open to Britain remaining a full EU member. No one is putting odds on Britain holding another referendum, but the circumstances are starting to emerge where it is possible to see a re-run will take place. Rawnsley says there is a rise in buyer’s remorse among those who voted for Brexit, but not enough yet to force the politicians to choose a re-run.